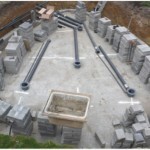 The vital importance of taking both pond base dimensions and correct positioning of bottom drain/s into account. Before I start this section I must point out I have ever yet to see any two pond bases that are identical. Because of this, this part of the system design must first be considered thoroughly before filter unit/s can even possibly be discussed. Whilst most of this is extremely logical, it must be applied to a specific pond base so, without pages upon pages of ALL pond bases imaginable, it is foolish to generalise. If readers are confused with this aspect of design please email me and I will try to assist with individual specific base dimensions proposed. 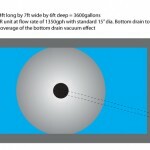 Here is just one example of getting improved drainage vacuum effect for a particular pond base shape. 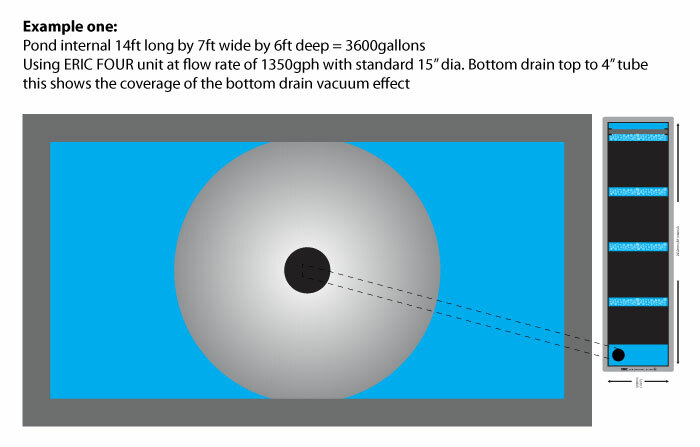 This shows the vacuum effect on this pond base by using a centrally placed drain on an ‘ERIC FOUR’ unit. Whilst the biological stage of the filter is far more than adequate for this volume of water, it is not nearly so efficient in servicing the base of the pond itself. 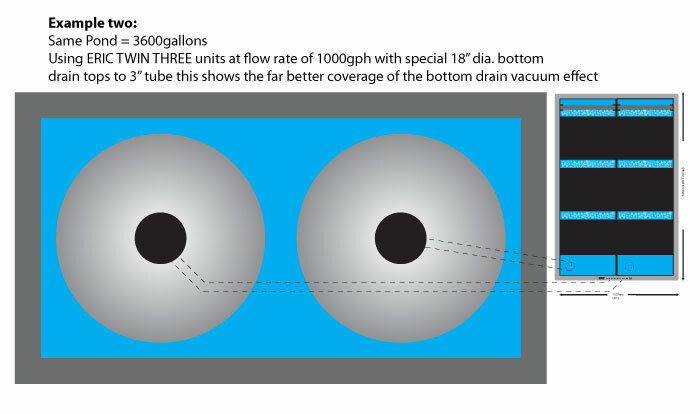 By using a two-drain pond base and a smaller ‘ERIC TWIN THREE’ system we can now see how much more of the pond base is served by vacuum effect. The drain tops have been increased in size and 3” bore tubes replace the 4” tubes to produce a greater suction performance. There are several alternatives open for consideration when designing a pond base, generally a gentle fall from the vertical pond walls to a flat area near to the drain sump perimeter is all that is usually required but slightly steeper falls can be made if needed. 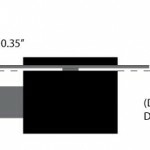 As mentioned above, there is also the availability of having drain tops made to a larger diameter thus being able to reduce the gap between the pond base and the underside of the drain top without restricting water supply. 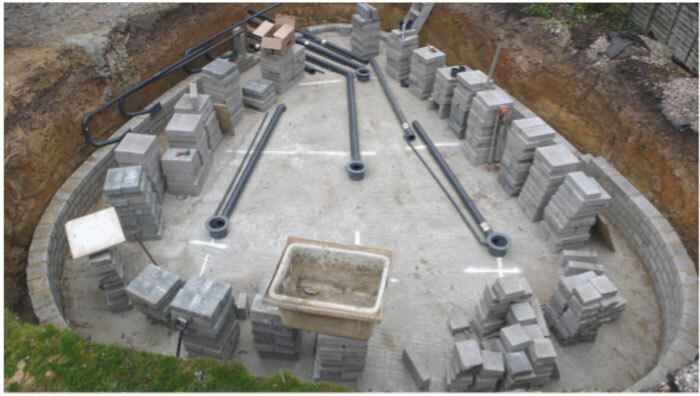 Further options to increase vacuum effect on a sizeable pond base can be made by using drain sumps with more than one outlet as shown here. 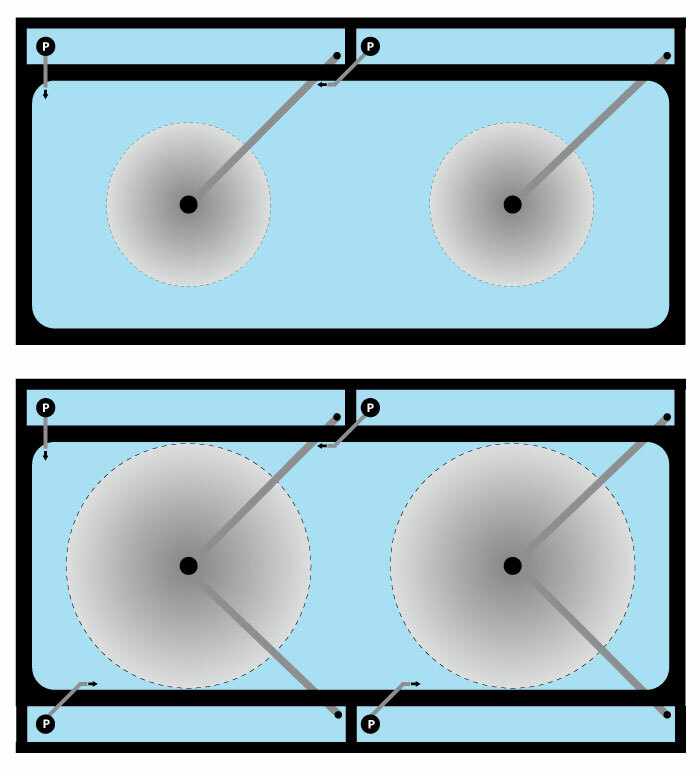 By using multi-off takes to a single drain sump we still retain the vital ‘One Drain to One Filter to One Pump’ principle. This is a perfect example of the ‘One drain to one filter to one pump’ method and shows an installation on a pond to hold around 17,000 UK gallons with the drain locations marked as shown. This will have two ERIC TWIN FOUR units to filter the system when completed. Before I start this section I must point out I have ever yet to see any two pond bases that are identical. Because of this, this part of the system design must first be considered thoroughly before filter unit/s can even possibly be discussed. Whilst most of this is extremely logical, it must be applied to a specific pond base so, without pages upon pages of ALL pond bases imaginable, it is foolish to generalise. If readers are confused with this aspect of design please email me and I will try to assist with individual specific base dimensions proposed. Here is just one example of getting improved drainage vacuum effect for a particular pond base shape. 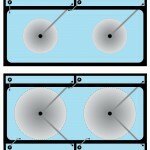 This shows the vacuum effect on this pond base by using a centrally placed drain on an ‘ERIC FOUR’ unit. Whilst the biological stage of the filter is far more than adequate for this volume of water, it is not nearly so efficient in servicing the base of the pond itself. 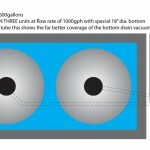 By using a two-drain pond base and a smaller ‘ERIC TWIN THREE’ system we can now see how much more of the pond base is served by vacuum effect. The drain tops have been increased in size and 3” bore tubes replace the 4” tubes to produce a greater suction performance. Further options to increase vacuum effect on a sizeable pond base can be made by using drain sumps with more than one outlet as shown here. By using multi-off takes to a single drain sump we still retain the vital ‘One Drain to One Filter to One Pump’ principle. This is a perfect example of the ‘One drain to one filter to one pump’ method and shows an installation on a pond to hold around 17,000 UK gallons with the drain locations marked as shown. This will have two ERIC TWIN FOUR units to filter the system when completed.